I love Kings Beach in Caloundra! That is very nice. In my impression, Surfers Paradise sounds like a shopping mall. Kings Beach is like a beach. That is the reason to love there. In Sydney, if you want to have tasty seafood, you know the place to go is Sydney Fish Markets. For Brisbane, I suggest you can go to Morgans Seafood in RedCliffe. Sydney Fish Markets has a lot of shops to sell fresh sea food. You can choose one you like. In there, the choices are not many. But there are some fresh fishes! The most of important part is the oyster bar! Last times I went to there, we ordered a dozen of pacific oysters. That is very very tasty and sweet too! Besides of oysters, their Fish & Chips Combo is not bad too. It was only around $10.90 with a box of Fish & Chips with a bottle of drink. Although the price is not expensive, the quality was not compromised at all. The Cod Fillet was was tasty!!! In addition, there are some outdoor seats which is very good! You are not just able to enjoy the sunshine and fresh air in there, that is next to Scarborough Boat Harbour too! You can enjoy the scenery with foods too! I really want to go to there again!!! I had a cup of potato gems in springwood. That is around $2.50. It is a cheap! Moreover, I love this kind of food a lot, I like its texture. I like it more than chips! Lastly, I cannot find it in Hong Kong, I only can find this in Australia. Fortunately, there are many alternative getaway choices around the Brisbane area, such as my new favourite, Redcliffe. It is without a kilometers long beach, but there are some “small” beaches. Those beaches are very beautiful too! I like to walk along those beaches. In the meantime, I can enjoy the wind from the ocean and watch the blue ocean!!! That is very nice. Besides of those beaches, there are some nice coffee shops near those beaches and fresh seafood too! The most important part of Redcliffe is that it is peaceful. Redcliffe is not too busy. I can have some quiet time in there! Last night, we had thunderstorm, heavy wind and rain. I felt my house is shaking. Some friends told their house got some damages by stroung winds too and some power outages is around10pm. This morning, the weather got better. There is still some shower and sunny. I wish the bad weather will be better. Every year, those high school graduates will go to Surfer Paradise for parties. That is for celebrating they finished their high school life. They calls this as Schoolies Week. I don’t like to go Surfer Paradise during the Schoolies Week, because there will be a lot of people and even they will setup some parties on the breach of Surfer Paradise. I don’t feel this kind of situation is peaceful. I have been there a few years around that period. I felt very very noisy. According tot he Schooies website, this year Schoolies started today until 24th Nov. Well, I will stay in Brisbane during this period. I had a meeting until 2.30pm,that is very late. Fortunately, I had something during this meeting. But that was not enough . 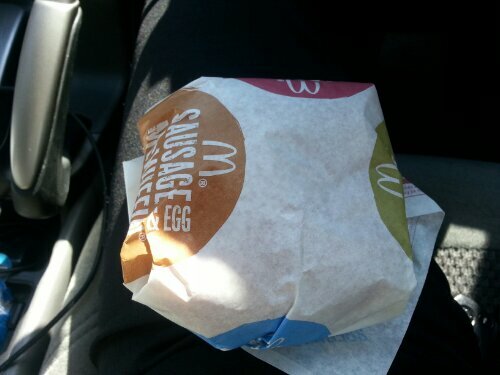 Thus I went out to McDonald’s. Then i found there are some special deals. The one I picked was Chicken and Mayo for $2.It tastes alright just a deep fried chicken breast and lettuce with bread. For $2, I did not except much. Moreover, the portion was good enough to be a light meal. I was quite happy for this $2 lunch. In addition , the deals are also included apple pie and small fries. They only cost around $1.50the each. That is the times for the low-priced dinner at IKEA again. That is somethings new, not Fish & Chips anymore. IKEA has a new menu. This is Cheese Baked Siathe with mashed potato and green beans. I love it a lot! Fish is good, I like the taste of cheese! In addition, I loved mashed potato a lot a lot! Besides, mashed potato with greens beans sounds healthier than Fish & Chips. That is less fatty. Lastly, because I am the member of IKEA member, I got a cup of free coffee. That dinner only costed me $3.95. I found there are Asian Style Bakeries around the Sunnybank area, such as BreadTop. Most of them are Taiwanese and Japanese Style, but there are not many Korean style bakery in Brisbane. As far as I know, there is only one Korean Style Bakery in Indooroopilly. Well, this week, when I had a haircut in Sunnybank Hills Shoppingtown, I found that there is a Korean bakery, New York Baguette. There are many, many choices of buns available. Moreover, I bought a custard bun which is very tasty! I will try other breads next times! That is so cool!